Industrial Ceiling Fans are powerful, large ceiling fans designed for use in large spaces such as warehouses, shopping malls, manufacturing plants, theatres, airports and large commercial buildings or offices. They are manufactured to last through continuous use and to move large volumes of air. Hunter have a large range of 24ft and below fans also. Check them out on their website here. What is the difference between a standard ceiling fan and an industrial or commercial ceiling fan? The main differences between standard and industrial ceiling fans usually lie in the blade size and power of the motor. Materials used also tend to vary. Standard ceiling fans are often made of lightweight materials such as wood or light plastics – this means they can be operated by small, quiet motors – which is exactly what you want inside a home. Industrial ceiling fans are normally constructed using steel, aluminum or even thicker plastic and composite materials. They are built for strength and their powerful motors easily manage the heavier materials. Industrial fans need to be extremely robust as they’re required to work much longer hours, or even continuously for days or weeks on end in the case of shopping malls or airports, for example. Large industrial settings usually require ceiling fans to move warm air accumulating near the ceiling downward where it can cool, which in turns lowers the overall temperature. They’re also used to provide ventilation and get rid of any gases or toxins in the air. In order to effectively move hot air away from the ceiling, fans need some room to work. Industrial fans are therefore always mounted on a down-rod to provide the needed space between the fan and the ceiling. The ‘working’ space required is determined by the size and height of the room, and the overall power of the fan being installed. Large fans require more space between the fan and ceiling to operate efficiently, whilst smaller fans require less space. This is why many household fans can be flush-mounted. Flush-mounted fans can’t produce as much airflow as those mounted on down-rods, but they’re perfectly sufficient for smaller rooms. The hanging height (distance between the fan and ceiling) varies depending on the size and power of the fan. In many cases, this can be adjusted depending on overall ceiling height in order to optimise the air circulation throughout the building/space. This is where it gets tricky as there isn’t a specific size point where ceiling fans cross over from being classified as traditional / home-use to industrial. To further complicate matters, many ceiling fan manufacturers have a ‘commercial’ category that falls somewhere in-between traditional ceiling fans and industrial ceiling fans. Commercial ceiling fans are often the same size as traditional ceiling fans, but they’ll have more powerful motors to increase airflow. Fans that fall in the commercial category are often used for small to medium-sized rooms that require constant airflow, such as classrooms or small workshops. Many of these rooms could, however, also be fitted with a small industrial ceiling fan, which further blurs the lines between traditional / commercial / industrial. To make things a little easier, below is a list indicating which size ceiling fans generally slot into each category. Note: Ceiling fan size refers to the diameter of the fan (the distance between the blade tips when measured in a straight line running through the centre of the fan). As a rule-of-thumb, most ceiling fans larger than 60 inches are classified as industrial ceiling fans and they reach sizes up to 288 inches (24ft). Some spaces, such as massive warehouses and production plants, may require even larger industrial fans, but these are normally custom-built for specific applications. Are there exceptions? Do you get smaller industrial or commercial fans? Yes. As mentioned above, size isn’t the only deciding factor when it comes to industrial ceiling fans. The Air King 9718, for example, is considered an industrial fan even though it’s only 18-inches in diameter. Thanks to its tough powder-coated steel construction and powerful motor, this oscillating Air King fan is ideal for certain industrial applications. Its fully-enclosed motor is permanently lubricated, so it is designed to be durable and operate for long stretches at a time. The Air King 9718 can be mounted to a roof or wall, but its small size means it won’t be effective if mounted to a very high ceiling. It’s designed for smaller industrial spaces and can even be a great ‘booster’ to direct airflow in large spaces in conjunction with larger ceiling fans. Check out our article on High CFM Ceiling Fans for the home. It all depends on the size of the space you need to cool or ventilate. Large warehouses will require a very different airflow setup than a small workshop. The number of people who work in the space, and the type of manufacturing that is done, plays a big role in the type of fans you’ll need to install. In cases where fumes or gases (such as paint shops) need to be ventilated, or where heat-generating equipment (such as welders) are used, you will need much stronger ventilation than in a movie theatre, for example. That’s the first step in deciding which product will be most effective. Unlike air-conditioners, ceiling fans don’t significantly lower the temperature of a room. Instead, they move the air to create a breeze which has a cooling effect on the occupants of a room. We all know that hot rises and cool air sinks, so by keeping the air in motion, ceiling fans mix the warm and cool air which keeps the space at a manageable temperature. Without a ceiling fan, warm air will continue to build up beneath the ceiling and this will gradually raise the temperature in the room. Ceiling fans prevent this from happening. All fans have an airflow rating that is measured in CFM (Cubic Feet per Minute). The CFM rating indicates the volume / amount of air that a fan can move per minute. In other words, CFM measures how far, in terms of feet, a fan can blow/push the air in one minute. If you know the volume (cubic feet) of the space where the fan will be used, you can use the CFM rating to work out how long it will take a specific fan to circulate the air in that space. Wind speed, which is measured in Miles Per Hour (MPH), indicates how fast a fan will move air from the ceiling to the ground. Although wind speed forms part of the overall CFM rating, it’s usually listed separately as it is an important factor to consider when buying a fan. Ceiling fans with a high MPH figure are never a good idea for offices, for example, as they will easily blow papers off any desks situated within their ‘line of fire’. This is why it’s so important to consider the exact size and use of the space before purchasing a fan. In cases where you don’t want fast-moving air blowing straight onto desks, you should opt for ceiling fans that can still move a large volume of air, but at a lower speed. On the flip side, if you need a higher wind speed (to quickly ventilate gases or potential toxins) you’ll want to look at fans with a higher MPH. Ceiling fans are electrical appliances, so wattage is always a deciding factor. Electricity usage plays a big role in many modern businesses – whether it’s on the manufacturing, storing, transport or outlet side. The wattage rating tells how you much electricity a fan consumes when it’s in use, which is a vital consideration for companies looking to reduce their energy consumption. High-power fans naturally have more powerful motors that tend to consume more electricity. However, there are many ways to avoid exorborant use of electricity. Shop around and get expert advice to work out the best ventilation plan/strategy – quite often the solution lies in combining different types of fans as well as precise placement. Fan technology is continuously being updated and there are plenty of energy-efficient options to choose from. It’s all about finding the right balance between power, placement, and wattage. 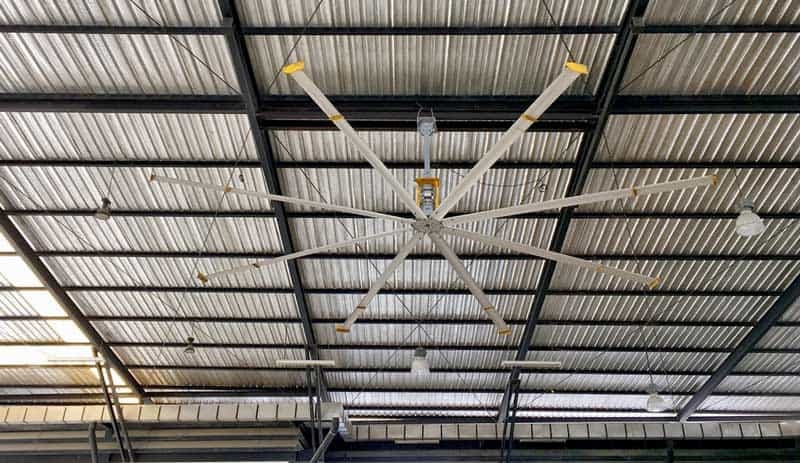 In the world of large industrial ceiling fans, motors slot into two broad categories: DC (Direct Current) motors, and AC (Alternating Current) motors. AC Motors: AC motors plug directly into the power source/plug point, which allows the current to reverse and run in both directions between the power source and the appliance (in this case an industrial ceiling fan). Many household appliances, and therefore also ceiling fans, make use of AC motors, because most power companies only supply electricity in AC format. Due to the reverse current, however, quite a lot of energy goes to waste. DC Motors: Fans equipped with a DC motor are plugged into a transformer, which in turn connects to the power source/plug point. The transformer acts to turn the Alternating Current coming from the power source into a Direct Current, which then operates the fan. Because the current is being routed in a single direction, there is no unnecessary or wasted energy, which makes DC motors a lot more energy efficient than AC motors. DC motors have been around for quite a few years, and their popularity keeps increasing due to their efficiency. On the surface, the logical conclusion is that DC motors are the obvious choice as they use less electricity, but that’s not always the case. AC and DC motors are merely the broad categories for ceiling fan motors. Ceiling fan manufacturers all use different motor configurations (fly-wheel, ball-bearing, stack and many more) to get the best possible performance out of their AC as well as DC motors. That said, DC motors have become the more popular choice for large industrial applications, as they do save a lot of electricity cost in the long run, especially if they run upward of 12 hours a day (or continuously). Keep in mind, however, that DC motors can only be powered via a transformer plugged into a regular power source – they can’t be plugged into alternative energy sources such as solar or hydro. For this reason, companies who intend to increase their use of alternative energy, opt for AC motors instead. They might use more power, but the trade-off is that the power comes in the form of clean energy. Ceiling fan motor size (AC and DC) is measured in millimeters and, just like car engines, bigger normally means faster and more powerful. The parts of the fan that actually move the air – the blades – play a huge role in deciding which industrial fan best suits your needs. The number of blades is also an important factor – fewer blades tend to move air more efficiently, but they also produce more noise. Airflow efficiency loosely translates into ‘return on investment’ and is calculated by dividing the amount of air a fan moves (CFM) by the amount of energy it uses to do so (Watt). This formula is recognized by the Environmental Protection Agency (EPA) and gives an accurate indication of how much you’ll be spending on electricity to operate a specific fan. In the U.S, the EPA (Environmental Protection Agency) awards super-efficient appliances with and Energy Star certification. If efficiency is your main concern, look for ceiling fans that have been Energy Star certified. Note that with all six factors mentioned above, there is no ‘perfect’ CFM, Wattage, or efficiency rating. It all depends on what is required of the fan (slow continuous air circulation, quick ventilation, directing air from one side of a building to another, etc). All of the above factors need to be taken into account to find the right balance between performance and efficiency for the specific space you have in mind. There are numerous types of industrial or commercial ceiling fans and manufacturers sometimes come up with very creative names to make their products stand out from the crowd. It’s difficult to define specific categories, as most ceiling fans can probably slot into more than one group. However, if you’ve just started your hunt for the perfect industrial ceiling fan, take a look at some of the options below. This way you’ll at least get a feel for where you need to start looking! This 96-inch (8.0 ft) large ceiling fan has eight blades and a brushed nickel finish. It is fitted with a 165mm x 12mm DC motor and the blades are pitched at 4°. Total Watts is 31 with an overall CFM of 10500. Airflow efficiency is 338 CFM per Watt. The Minka-Aire F887-96-BN has six speeds and comes with a remote control and wall holster for easy storage. Due to its large diameter, this fan is mounted 15-inches (1.25 ft) from the ceiling. An extended down-rod may be required for higher ceilings and it is also available with a light fitting that can be ordered separately. The Hunter 59132 is a 96-inch (8.0 ft) industrial ceiling fan with six aluminum blades coated in ‘fresh white’. It can be installed in either three-blade or six-blade configuration. This ceiling fan has a wattage of 113 and an airflow capacity of 11899 CFM (three-blade configuration) – this translates into an airflow efficiency rating of 100 CFM per Watt. The Hunter 59132 is mounted 11-inches (0.9 ft) from the ceiling and is built for either indoor or outdoor use. The two above-mentioned examples illustrate why it’s important to understand how fans work, what the numbers mean, and what your desired results are when purchasing a fan. These two fans are both 96 inches (8.0 ft) in size, but their outputs and efficiency ratings are very different. This is due to a variety of factors such as differences in blade pitch, number of blades, hanging height and wattage. Same-size fans can deliver vastly different results, and while both of these are considered to be excellent products, your choice will depend on which characteristics are most important for the space in which the fan will be installed. Smart fans are fairly new on the market and, as the name implies, they have nifty features that bring them up to speed with the latest advances in technology. The Haiku Smart Fan is aimed at home use rather than industrial, but it’s size and clever features make it an interesting option for small commercial applications such as offices or individual shops. The fan is available in 52-inch / 60-inch / 84-inch derivatives and is fitted with three sculpted blades. Customers can opt for blades made of bamboo, matrix composite, or aluminum in a variety of colors. What makes this fan so unique (and smart) is its ability to function in a fully-connected environment. The Haiku Smart fan is equipped with Wi-Fi and can communicate directly with Amazon’s Alexa. It features Haiku’s SenseMe technology that uses sensors so it can switch on when it picks up that someone is in the room – this means it has no manual switch or chain. The sensors also monitor the temperature and levels of humidity in the room so it can adapt accordingly. This genius fan is also capable of connecting to the rest of the house / office via Thread (a Wi-Fi application that allows you to control all connected appliances directly from your smartphone). The Haiku Smart fan might not be the ideal fan for most industrial applications just yet, but it’s a good indication of the direction in which ceiling fans are developing. Many industries will benefit from smart technology that continuously adjusts the fan settings to keep air circulating at the desired rate whilst keeping energy consumption to an absolute minimum. Fans with integrated lighting are convenient and can minimise the amount of energy used. For industrial use, integrated lighting means a much easier set-up as you don’t need different power sources and fixtures for lights and fans. In large spaces that require a number of fans and lights it is very convenient to streamline and simply install ceiling fans with integrated lighting. Keep in mind that the wattage on these fans will be higher as it includes the wattage for the light fixture as well as fan operation. This industrial ceiling fan is finished in brushed nickel and is equipped with six aluminium blades. It uses a high-efficiency DC motor and has an airflow capacity of 11230 CFM. Wattage (including light) is 30.9, which translates into an airflow efficiency of 363 CFM/Watt. It is extremely efficient considering its size and additional electricity used by the light. This specific fan is Energy Star certified. 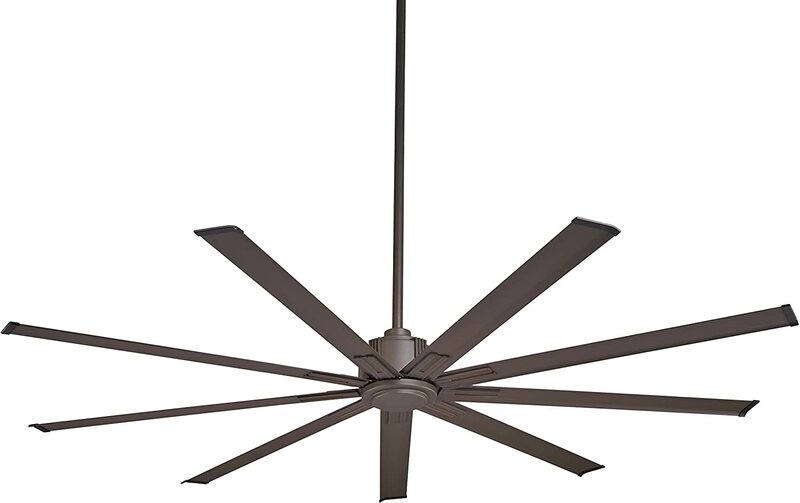 This 72-inch (6.0 ft) Emerson fan sports eight blades in Walnut finish. It features a single integrated light fixture that takes two 50W halogen light bulbs. The Emerson CF985BS offers an excellent balance of power, efficiency and convenience. It is also Damp rated, which means it can be installed in areas such as patios as well. This fan has also received the Energy Star stamp of approval. The Underwriters Laboratories (UL) rating indicates whether a fan is dry / damp / wet rated. Dry rated fans are for indoor use only, whilst damp rated fans are ideal for bathrooms / covered patios. Wet rated fans, on the other hand, can withstand a lot more and are perfect for outdoor use such as exposed decks or seaside verandas. They can handle all weather conditions from rain and hail to snow. This 84-inch (7.0 ft) industrial ceiling fan is fitted with eight blades finished in brushed nickel. It is UL Damp rated and has six different speed settings. Airflow capacity is 11190 CFM that allows for an impressive efficiency rating of 348 CFM/ Watt (excluding light). It comes with a remote control and a brushed nickel cap for those who prefer not to use the integrated light. This 44-inch (3.6 ft) Emerson outdoor fan has an oil-rubbed bronze finish and UL Wet rating. This three-blade fan with integrated light is ideal for uncovered decks and seaside weather conditions. Producing 4280 CFM it is not suited to large spaces, but it is ideal for small-scale industrial applications. The UL rating on industrial fans is important as this will dictate the environment in which the fan can be operated and also how it can be cleaned. Many businesses opt for industrial fans with a UL Wet rating because they can be hosed off without doing any damage to the fan. Large manufacturing and storage facilities (especially if refrigeration is involved) will install Damp or Wet rated industrial ceiling fans as a lot of moisture tends to accumulate in the building. Dry rated fans aren’t equipped to deal with high levels of moisture and can easily be damaged under such conditions. As a rule, Damp and Wet rated ceiling fans are more durable, which is preferable for most industrial facilities, even if conditions are completely dry. Many people use the UL rating as an indication of the fan’s quality and durability in general. The 60-inch (5.0 ft) Casa Vieja is a three-blade ceiling fan with a UL Damp rating. It’s three-blade configuration – angled at 22 degrees – gives it a truly industrial look and makes it a firm favorite on patios. HVLS fans are more ‘typical’ of industrial use – these are the fans you expect to see in large manufacturing and storage spaces, as well as shopping malls and airports. 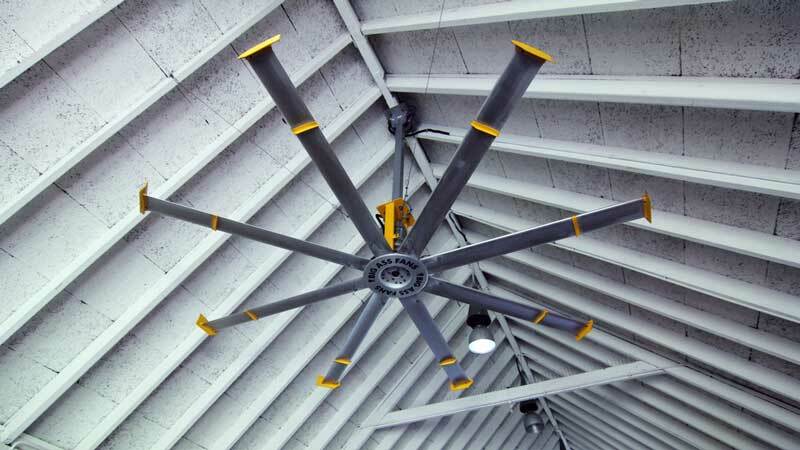 HVLS industrial ceiling fans usually range in size from 72-inches (6.0 ft) up to 288 inches (24 ft). Manufacturers that specialize in large HVLS fans will often custom-build these fans, especially for customers who need bigger size fans. The Skyblade 192-inch (16 ft) HVLS fan has four wing-tipped blades and is constructed using stainless steel and anodized aluminum, with a Black Powder finish. This gigantic fan produces has a whopping airflow capacity of 166 456 CFM. The 288-inch (24 ft) Skyblade delivers over 260 000 CFM. You can view its specs here. The principle behind HVLS fans is to move large volumes of air and provide effective ventilation for large buildings but without a strong breeze. 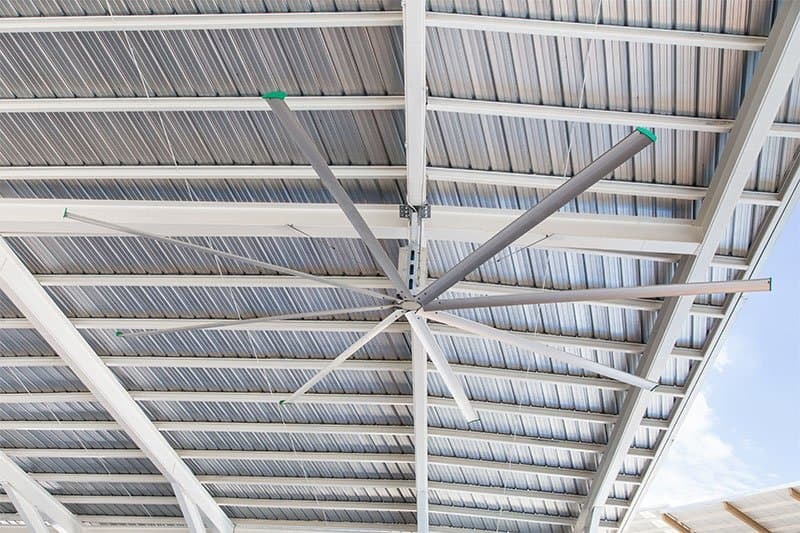 So rather than use force to blast air from one side of the building to another, HVLS fans combine blade shape, length and pitch to provide slow and consistent circulation. The large blades ensure the fan has similar ‘reach’ to high-power fans with smaller blades. This also comes with in a larger 20ft blade model as well as a slighter smaller 12ft blade model. As with all other appliances, industrial ceiling fans last longer if they’re well maintained and regularly cleaned. Unlike a grimy oven, however, the biggest concern with industrial ceiling fans is to prevent build-up of dust. If the fans are installed in areas where there is a lot of moisture, or gases (such as paint shops), they will need to be cleaned more often. Depending on how high the ceiling is, you can use anything from dusters to canned air to remove any accumulated dirt. In cases where fans are completely out of reach (such as airplane hangars), many customers opt for Wet rated fans that can be hosed down. Others get creative with scaffolding or ladders. Many industrial ceiling fans have special coatings that prevent dust from clinging to the blades. Fans that aren’t cleaned regularly are at risk of not functioning efficiently (if grime disrupts airflow over the blades) as well as damage to the motor if grime accumulates in the motor housing. There are countless different styles and designs when it comes to industrial ceiling fans. Only the truly massive fans – from about 120-inches (10.0 ft) and upward tend to be completely utilitarian. Large industrial ceiling fans can be found in any style ranging from sculpted wood and vintage to ultra-mod. Over the past few years, beautifully sculpted large fans have become very fashionable, and the trend is to install as big a fan as the size of the room will allow. For this reason, large size fans that were previously considered only for industrial use, are now being installed in living rooms all around the world. Manufacturers quickly learned to capitalize on this trend, and companies that previously only supplied to warehouses are now selling their large fans as décor statements to the trend-setters. Those who genuinely need a ‘workhorse’ fan need to be aware of this trend, because you don’t want to end up installing fans in your warehouse that may look the part, but don’t deliver. On the flip side, this new affinity for extra-size fans, means that businesses no longer need to settle for bland / boring ceiling fans just because they have a bigger space to ventilate. Offices, schools, shops, boutiques and workshops have a huge variety of styles to choose from, so there’s no longer and excuse for depressing office ceiling fans. From smart fans who can chat to Alexa to blades carved from solid oak, there isn’t much you CAN’T get when it comes to industrial ceiling fans. The trick is to find the right combination that suits your needs – you want a fan that’s easy to operate, but you don’t want to pay for unnecessary features or accessories. Depending on your choice of fan, the above features are simply a few examples of what’s available. Make sure you read through the features list carefully as ‘tricky’ wording can lead to lots of confusion about the exact features included in the price. The price of industrial ceiling fans varies just as much as the styles and sizes available. The prices of the fans listed in this article range from around $145 for the 18-inch Airking to over $6000 for the 20-foot Skyblade. Just like specification, pricing is a factor that buyers need to weigh up and decide what works best. As with most products, if you go for the cheapest option you will likely sacrifice some level of quality. Shop around and compare several fans similar to the one you’re looking to buy to get an idea of the general price range. Fans that are only used for a few hours every week don’t need to be as sturdy as those that operate continuously or for extended periods of time. If you’re looking to install large industrial ceiling fans, it’s a safe bet to avoid suspiciously cheap products, because these fans need to work hard for many years.